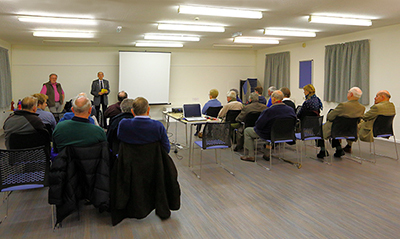 Members and guests met on Monday 27th March for the 2nd Open evening of the season. Our high profile speaker was Barry Mead FRPS MPAGB APAGB EFIAP/p, from Bristol. Barry has been involved with photography for many years. He has served on Distinction Adjudication Panels as well as serving on National and International Salon Judging Panels, gaining many awards along the way. His interests in Travel and Nature had taken him to many remote places in the world and some stunning images of Sandhill Cranes, Great Blue Heron, Grey Lag Geese, Marshall Eagles and Albatross followed. Mammals such as Jackals Cheetahs, Elephants and Penguins were also represented from countries as far apart as Namibia, Kenya, Florida USA, to the Falkland Islands. For some time now Barry has moved over to the 'Dark Side,' a world where fantasy and altered reality merge to create mind blowing images, with the aid of Photoshop. We were treated to a series of images of space with planets (made from polystyrene balls) and spaceships, reminiscent of a Star Wars movie. This was followed by flights of fancy such as the "Mad Hatters Tea Party," Apes driving an old car across the desert to Penguins, complete with luggage, boarding a disused DC3 plane in the snow. Barry went to great lengths to explain how, using many layers, each image had been painstakingly produced. Although the expected number of visitors was down on previous events, everybody there had learnt an awful lot and had a very enjoyable and inspirational evening, thanks to Barry's light hearted and humorous talk.